Having a farm of just 31 hectares (76 acres) has been no obstacle to large-scale success for Chris Pickering, who achieves a throughput of about 3,000 calves per year and has been described by an industry professional as ‘probably the best calf rearer I know’. As a result of his endeavours, Chris not only reaches his target average growth rate of 1.5kg/day between seven days and 12-14 weeks, but he has achieved up to 1.92kg/day for the fastest growing batch which recently passed through the system. Achieving such performance from mostly dairy cross British Blue or Limousin calves on Barmby Farm, near Pocklington, Yorkshire, results from a lifetime’s experience as a calf rearer and a scrupulous attention to detail. Farming with his son Ben, aged 18 and a recent graduate from Askham Bryan College, the team set up the calves for a successful start before they even arrive on-farm. Buying mostly direct from farms and a few from Bentham Auction Mart, ForFarmers account manager Stuart Rhodes, with whom the family has done business for many years, takes up the Pickerings’ story. He says: “They will only buy from farmers who they have a relationship with. This means they will know the disease status of the herds they buy from. They will know they are from a low-risk TB four-year testing area and they have got to know those who properly feed colostrum to their calves. Having identified their suppliers, they will then take the greatest care when transporting the calves to the farm. The Pickerings know from experience the wrong conditions in transit could cause too much stress and have the potential to set up respiratory problems. Once they are on-farm, all of the calves, aged from a week to 10 days old if bought off-farm or about a month if they come from the mart, are given an electrolyte solution to help them rehydrate and ‘clean out the gut’. Stuart says: “This seems to be a really effective practice. The calf’s abomasum is the only truly functioning stomach at this early age, but if milk has previously been fed in to high a volume, it may have spilled into the rumen. Once rehydrated, calves move on to their first feed of 2.5 litres of milk, increasing to three litres per feed (six litres/day) until about six weeks of age. Making up their first feed with 150g of powder for each litre of milk, this is stepped up after a week to a higher concentration at 180g/litre. Those which fall back within their group will stay behind to join the next batch coming through, using a technique which has been proven in trials to turn around the calves’ performance. 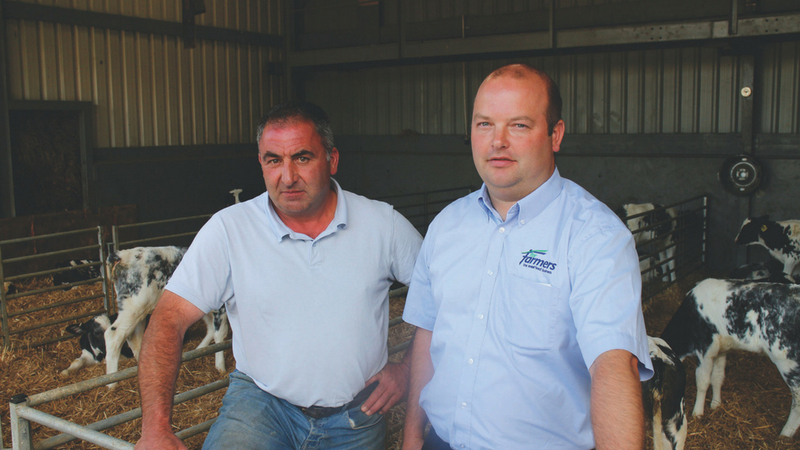 The milk powder chosen by the team at Barmby Farm is the ForFarmers 23 per cent protein product VITAMILK Omega Gold, which was recommended by Stuart when he recently moved to the company. Chris says: “Stuart put all of the products on the table when he joined ForFarmers and I said if they were better than those I was using, I would take them on. He refers to the company’s Care+ package included in VITAMILK Omega Gold, which includes the herbs fenugreek, eucalyptus, pine, mint and echinacea, which help improve gut and respiratory health and improve overall immunity. The Pickerings also moved the calves on to a top-of-the-range concentrate, VITASTART Extra, which is offered from their arrival. Stuart says: “This is a 6mm nut which has been shown to increase intakes over a smaller pellet, and also includes the Care+ health package, as well the live yeast Levucell TITAN. VITASTART Extra’s high energy, its 18 per cent protein and its complement of vitamins (A, B, D and E), minerals and key trace elements (zinc, iodine, cobalt and selenium) will also help optimise animal health. 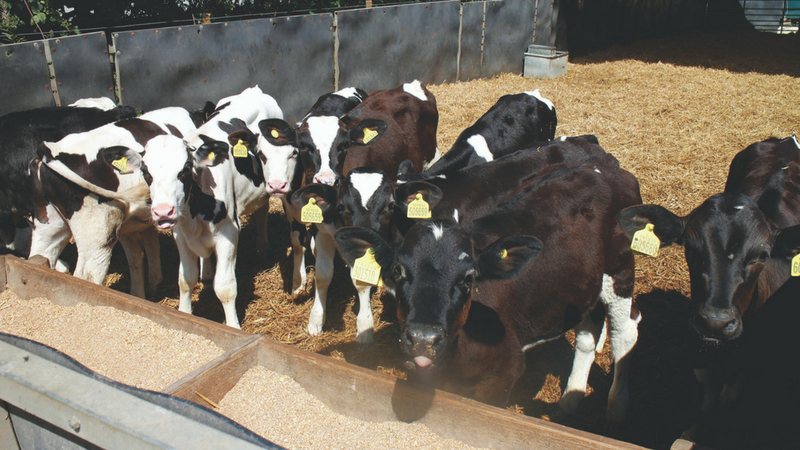 Calves remain on the premium milk replacer, fed from troughs after a disappointing trial with automatic feeders, with access to clean straw in racks until about six weeks of age. Reared in large airy pens – recently some through pig tents which are solid and draft-free up to a metre, but have open sides and air-flow above – calves which come through the system are now said to be healthier and faster growing than ever before. Mortality does not exceed one per cent, scouring is insignificant and antibiotic use is markedly down. “Long-term buyers continue to return to the Pickerings for weaned calves time and time again,” says Stuart, who describes the family as ‘probably the best team of calf rearers I know’.